Australian Pink Clay Mask | Renew Skin with Bio-active Botanical Extracts. Australian pink clay is blended with bio-active rose, rosehip and hibiscus for a plumping hydrating mask. Rich is silica PINK encourages cell regeneration and renewal while gently exfoliating for brighter fresher looking skin. Packed full of Vitamin C and Vitamin A rosehip rosehip is dry or mature skins best friend. Rosehip encourages cell renewal and repairs aging uv damage. Hi 5 rosehip!!! The dark red hibiscus grains hide anti aging super powers. Hibiscus can stop elastase in our skin from breaking down, fighting the skins of aging and encouraging firm lifted looking skin. Rose has been used for centuries to soften and beautify skin. It naturally hydrates, balances and gently heals skin. Anti-inflammatory properties reduce puffiness and anti-bacterial properities stop pores getting clogged. 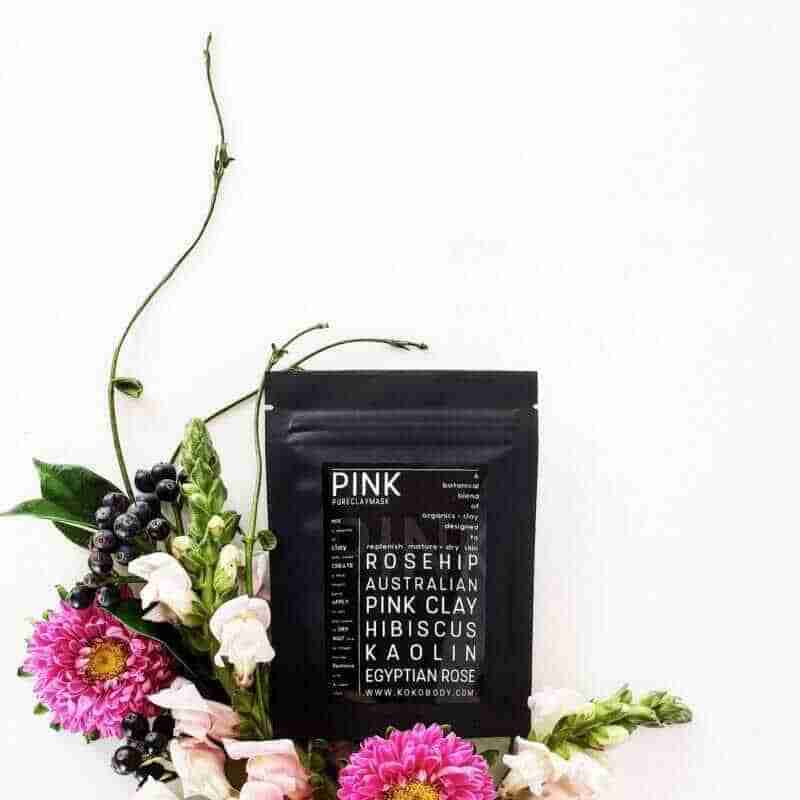 Vitamin C in rose encourages collagen production for that youthful looking glow. Australian Pink Clay is perfect for sensitive, mature or dry skin. It gently cleanses and exfoliates skin without stripping moisture. A botanical blend of rosehip, rose and hibiscus regenerates and renews by giving skin a boost of antioxidants and Vitamin C and A. The combination of bio-actives is designed to hydrate and nourish to fight against the formation of fine lines and wrinkles leaving skin feeling soft and rejuvenated. To activate your pink mask mix one teaspoon of PINK with half a teaspoon of water. Gradually add a little more water until you get a thick consistant paste. If the mixture is too thin add a little more PINK mask powder. If the mixture is too thick slowly add a little more water and mix until the consistancy is correct. Apply the mask using a brush or fingers working from your nose outwards. Avoid eye and mouth area. Apply thickly to avoid mask drying out too quickly and drawing moisture from your skin. Leave on for between 5 to 15 minutes then remove with a damp warm cloth. *If you have sensitive skin we recommend yellow or our pink clay mask. Kaolin, Quartz (Australian Pink) Clay, Kaolin (White) Clay, Hibiscus Sabdariffa (Hibiscus) flowers*, Rosa Centifolia (Rose) flowers*, Rosa Canina (Rosehip) flowers*.